We’re not really sure how it already came to be June, but that means two amazing things: Father’s Day and summer! 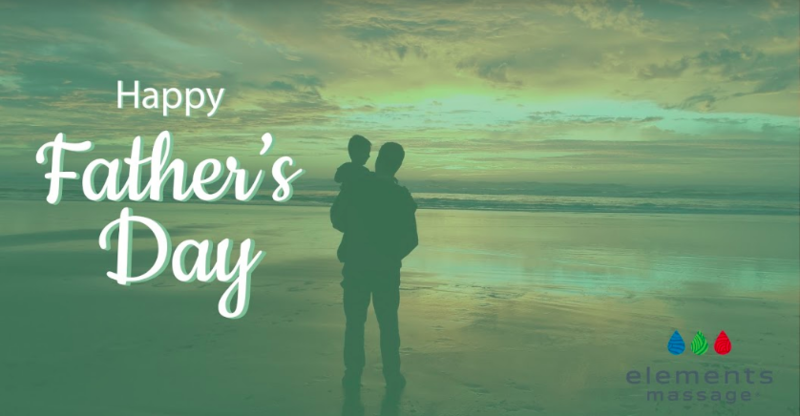 But first things first, it is time to celebrate Father’s Day and give our dads or father figures everything they deserve on their special day. While shopping for men is terribly difficult, Elements Massage has made it easy for you. As the snow melts, summer approaches, and the weather gets better, yard work begins to appear. Whether your father enjoys yard work or finds it a chore, he deserves a big chunk of relaxation afterwards. That’s why Elements Massage is offering $20 off all gift cards from June 1st-June 17th! Father’s Day shopping made easy, yet successful. While we’re offering discounted gift cards, there are several massage services to choose from! It may seem overwhelming at first, but luckily we are giving you a detailed outline of every service we offer, and what one is best for which kind of dad. When you choose to add aromatherapy to your session, you also choose which oil you wish to experience. Elements Massage offers four different oils so that you can find the perfect one for you. Between lavender, eucalyptus, radiance, and vitality, you are bound to have the most relaxing and revitalizing massage yet. Each aroma has different benefits. Lavender: this floral scent is perfect for someone who wants an overall relaxing session that will improve their mood and promote a deep sleep. Eucalyptus: you will want this sharp herbal scent if you want something that will be stimulating and purifying for your senses, promoting a more clear and focused mind. Vitality: Similar to lavender, this light floral scent is a blend of oils meant to help improve your mood and calm your senses. A brand new Elements Massage service crafted to deliver a truly differentiated massage experience that features application of essential oils to powerful pulse points, traditional inhalation therapy, and more. Energize*: With lemon, ginger, and geranium, Energize provides a stimulating and invigorating experience that uplifts the senses while providing balance and purification for a deep cleanse. Calm*: Comprised of lavender, nutmeg, and black pepper, these ingredients come together for a treatment that is nurturing, relaxing, and actively relieves muscle pain and headaches! Refresh*: Eucalyptus, peppermint and patchouli are combined for an enlivened, yet balanced and soothing experience. This naturally purifying and calling scent freshens the air and supports deeper breathing and total relaxation. The main focus of integrative reflexology is to help ease muscular tension and improve circulation while creating a relaxing and therapeutic session. It is different from traditional reflexology, an alternative medicine applied without lotion or oils that focuses on intricate application of pressure points to feet, hands, and ears, with specific finger techniques. Integrative reflexology is specifically designed for massage therapists during a 60 or 90 minute session. This type of massage therapy has been found to reduce stress and anxiety, ease muscular tension, reduce swelling (from injury or lymphatic build up), and improve overall bodily functions such as: respiration, circulation, sleep, digestion, and cognition. Additionally, many reports have found that it helps clear and drain sinuses. Another great aspect of integrative reflexology is that it is kid friendly and can help boost immune function and digestion, which also minimizing the symptoms of ADHD. Many people have found integrative reflexology to be the perfect type of massage for them. Not only does it leave you calm, relaxed, and rejuvenated, but it can also help address specific concerns you may have with your body. Additionally, it can help decrease symptoms of autoimmune diseases. It has been found that hot stone therapy aids in relieving painful conditions such as fibromyalgia and rheumatoid arthritis. Studies were conducted on patients with these conditions and results found immense improvements in pain relief, movement, trigger points, and grip strength. In addition to assisting with autoimmune diseases, it can help decrease cancer symptoms. For cancer patients, massage therapy is a big contributor in decreasing fatigue, pain, and anxiety. Overall, hot stone massage therapy also calms your nerves and can stimulate optimum function of your nervous system. Cold Stone Massages are ideal for people with injuries—specifically sports injuries—sinus pains, dark under-eye circles, congestion, menstrual cramps, headaches and migraines, and can overall help improve a person’s mood. Due to the cold stone’s ability to reduce swelling, pain and discomfort, accelerate healing, it is the perfect addition to your new wellness routine. Specifically, they can be beneficial for people who regularly suffer from migraines. Anyone who has endured the pain of a migraine knows that it is not your regular headache. After countless pain-killers, sitting in the dark, and cooling packs, the pulsating tension does not go away. However, with the cooling stones, migraines can be gone in under an hour. Many studies have been conducted on the overall benefits of cold stone massage. In conclusion, these studies showed that the practice of regular cold stone massages reduces the occurrences of headaches and migraines, improves quality of sleep and mood, and aids in the reduction of stress and anxiety levels. Himalayan Salt Stones provide a gentle exfoliation that regular hot stones do not. This will leave your skin feeling smooth as ever after your session. Also, Himalayan Salt Stones and their 84 naturally occurring minerals give off negative ions; this means that it greatly aids in the reduction of inflammation. Inflammation occurs when there are too many positive ions in the body, and by providing your body with negative ions through the salt stones, you can rid your body of inflammation and toxins. So whatever dad may need, we have! Remember the offer is only available for purchase until the 17th of June! Get ahead of your Father’s Day shopping and buy this amazing offer on our website.